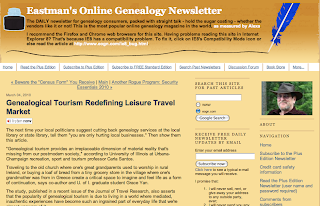 Today I was reading the Eastman's Online Genealogy Newsletter titled "Genealogical Tourism Redefining Leisure Travel Market". It made me start thinking about what Greece would need to do to develop genealogy tourism and encourage people to reconnect with their Greek roots. - Travel arrangements to Athens, and then onward to any other cities or villages for research. - Provide translators (fluent in English, French, German & Greek) - other languages? - Guides trained in Greek records: baptism, marriage, death, military, etc. - Seminar on Greek culture shock - dress codes and appropriate conduct for visiting churches and cemeteries - burial customs, previous dowry laws, marriage customs, holidays, importance of family, different types of records that might be available. - Guides/translators to either accompany people to the village, or contacts in each region that could meet up with the visitor and help them with their research. - Have guides help make connections between visitors and their ancestors in Greece. Wouldn't it be great! Would love to hear your thoughts. Good luck with your Greek family genealogy research. I would love to do something like this. How do we get started? I have always thought there should be something like this, or something like a Greek genealogy cruise. I am definitely interested. What a terrific idea! I would support this 100% and volunteer to work with others to look into the possibilities. This is exactly what I would like to do. Going to Athens is one thing but getting more information on Chios and Kalymnos would take a local.